Mutsumi Otohime is a gentle, frail, clumsy and soft-spoken 21-year-old woman who lives in Okinawa. Mutsumi is prone to catatonic fainting spells that makes her appear as though she has died. She is also described by the others as being sisterly, kind and caring, yet a ditz. Like Keitaro, she is a third-year ronin trying for Tokyo University. However, her reasons for failing are because of simple mistakes such as not putting her name on the test or succumbing to her anemia and fainting during the exam. 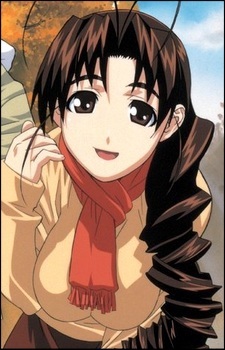 In the manga and anime she, along with Naru, was a childhood friend of Keitaro with whom she promised to go to Tokyo U together. Mutsumi has an affinity for watermelons and turtles and gave a latter one, Tama-chan, to Keitarō and Naru as a gift. Mutsumi has eight brothers and sisters and has a striking resemblance to her mother. She is called the "female version of Keitaro" due to their shared clumsiness. When Kanako begins to run the Hinata house, Mutsumi disguises herself as Keitaro to test the girls on their hostess skills; the resemblance is so uncanny that momentarily even Naru is fooled.